SHANKHNAD.ORG: ISIS GROUP TO ATTACK SAUDI NEXT. COME ON IN. Islamic State leader Abu Bakr al-Baghdadi called for attacks against the rulers of Saudi Arabia in a speech purported to be in his name on Thursday, saying his self-declared caliphate was expanding there and in four other Arab countries. Baghdadi urged supporters in Saudi Arabia, the world's top oil exporter, to take the fight to the rulers of the kingdom, which has joined the U.S.-led coalition in mounting air strikes against the Islamic State group in Syria. "O sons of al-Haramayn...the serpent's head and the stronghold of the disease are there...draw your swords and divorce life, because there should be no security for the Saloul," Baghdadi said, using a derogatory term to refer to the leadership of Saudi Arabia. Since Islamic State began an offensive in Iraq in June, Saudi Arabia has sent thousands of troops to the border area. 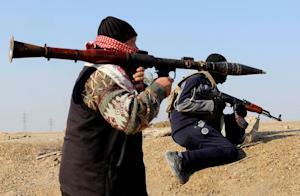 Islamic State has seized swathes of Syria and Iraq and in June declared a caliphate over territory it controls. Baghdadi said he had accepted oaths of allegiance from supporters in Libya, Egypt, Yemen, Saudi Arabia and Algeria. "We announce to you the expansion of the Islamic State to new countries, to the countries of the Haramayn, Yemen, Egypt, Libya, Algeria," Baghdadi said. The speech was transcribed in Arabic and translated into English. Although supporters have pledged allegiance to Islamic State in countries including Lebanon, Pakistan and Afghanistan, Baghdadi singled out only those five states, picking countries where sympathisers have a strong base and could mount attacks. He added, however: "Oh soldiers of the Islamic State...erupt volcanoes of jihad everywhere. Light the earth with fire against all dictators." Referring to U.S.-led military action against his group, Baghdadi said: "Despite this Crusade campaign being the most fierce and severe of all, it is the greatest failure." "We see America and its allies stumbling in fear, weakness, impotence and failure." Referring to Yemen, where Shi'ite Houthis captured the capital Sanaa in September, forcing the government to resign, he said: "Oh soldiers of Yemen...be harsh against the Houthis, they are infidels and apostates. Fight them and win against them." Baghdadi also congratulated supporters in Egypt's Sinai for starting jihad against what he called the "dictators of Egypt". He also urged supporters in Libya, Algeria and Morocco to prevent secular groups from ruling. After Baghdadi's speech, Egyptian militant group Ansar Bayt al-Maqdis, which swore allegiance to Islamic state this week, changed its name to Sinai Province on the Twitter feed claiming to represent it.